The 600-year-old Zhangguying Village is named after its founder Zhang Guying, an ancient feng shui master who is considered the common ancestor of the people who now live there. The interconnected housing compounds in Zhangguying Village resemble a honeycomb. 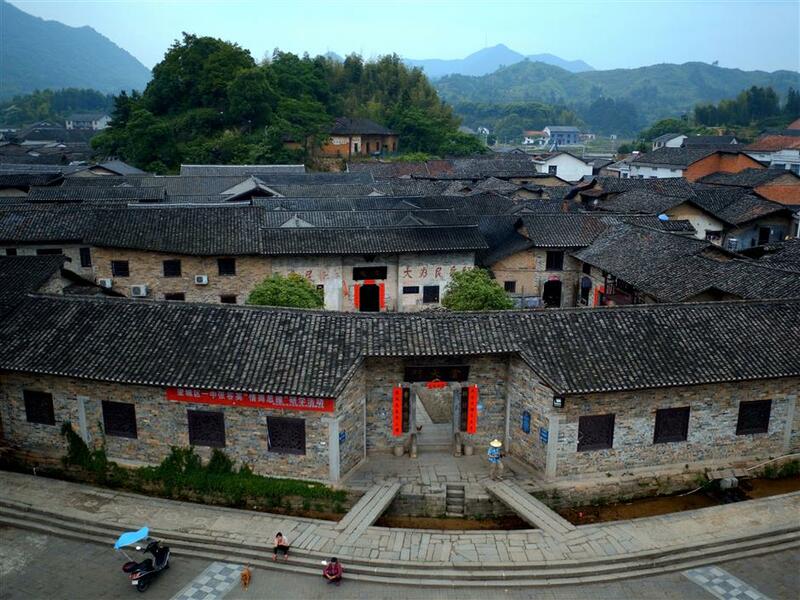 Zhangguying Village in Hunan Province was among the first in China to be listed as a historic preservation town back when the concept of safeguarding cultural heritage was first catching on. The 600-year-old village is named after its founder Zhang Guying, an ancient feng shui master who is considered the common ancestor of most of the thousand or two people who now live there. What distinguishes this village from so many others across China is the dragon-shaped, connected complex of houses and courtyards, mostly still intact, that were built centuries ago for extended families. 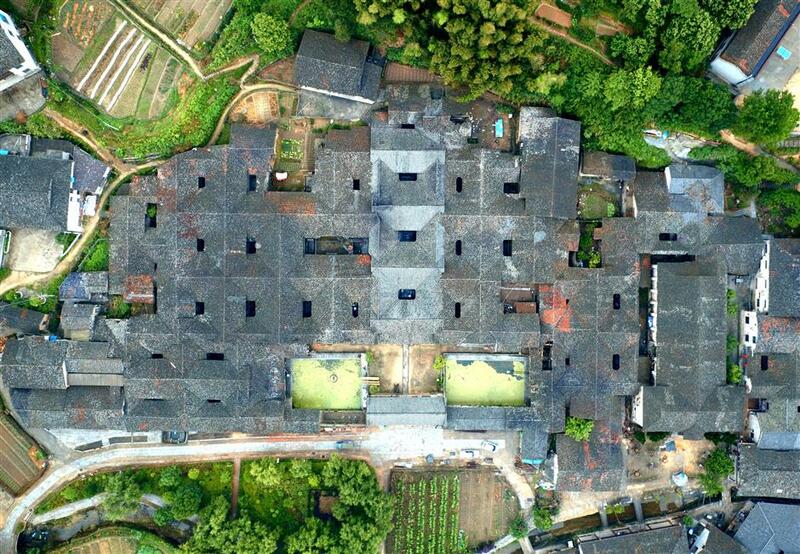 The “dragon” comprises 658 households and 1,700 rooms, sprawling over about 5 hectares. It is organized into three large courtyards connected by four halls. The most prominent — Dang Da Men, which means “first big gate” — was built 471 years ago. It has 422 rooms and 24 smaller courtyards. Its main hall serves as a site for village ceremonies, like weddings and ancestor worship. The original hall was destroyed during the “cultural revolution” (1966-76). In the town’s plaza, about 300 young people are gathered around a bonfire, making the noise of merriment amid the ghosts of the past! Some dance to pop music. They are part of a matchmaking excursion from a city nearly three hours away by car. They may or may not fall in love with one another, but it’s hard not to fall in love with the village. “I was completely stunned when I came to this village by accident in 1989 for the first time,” says Zhang Anmeng, a former documentary TV director, who was among the first in the modern generation to catalog the architecture and customs of the village. The complex of houses and courtyards is laid out in the shape of a dragon. Courtyards in the family compounds of the village are flanked by a symmetrical household units typical of ancient Chinese residences. Sky wells and halls in the centers. Several bedrooms in both wings. Kitchens and other common areas in the back. What’s uncommon is that each of the three units between the entrance and back door have the same vertical structure replicated on each wing of the courtyards, extending to another three to five branches into a fishbone-like maze. Village residents in their 70s and 80s still remember how they could run across the entire village without ever having to step outside because all the complexes were connected behind doors. For its scale and sophisticated design, Zhangguying has been known as the “civilian forbidden city.” The ancient wisdom is still witnessed in more than 1,700 rooms and 206 sky wells of the three remaining compounds, well-protected and repaired every year. The others were destroyed, disconnected or rebuilt over the years before the villagers realized their cultural value in the 1980s. For example, the narrow and winding paths all over the compounds not only connect different courtyards, but also help with air circulation and prevent fire from spreading throughout the entire complex. 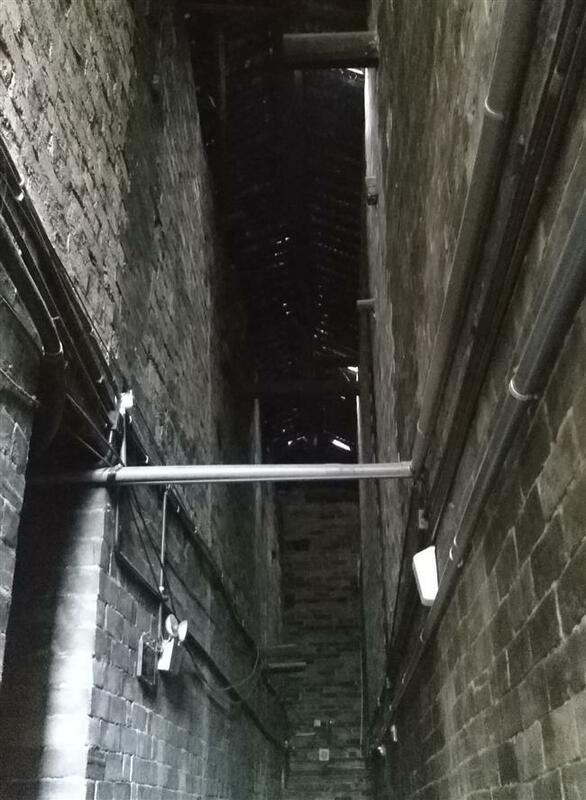 The pathways are just wide enough for one person to pass, so young men in the village would press their hands on opposing wall sides and shimmy up to disconnect tiles on the rooftops to prevent fire from spreading. The narrow, winding pathways are just wide enough for one person to pass. Since all the courtyards and complexes are connected at the roof level, they form a magnificent scene of endless tiles layered and juxtaposed onto one another. Viewing it from above, it has a snakelike effect extending into the surrounding mountains. The village’s administration has partnered with a tourist company, hoping to generate some income from the site’s unique structure and heritage. Residents have swapped their rooms in the compound for apartments in a nearby town to make way for the project. The village could be casual and bustling at the same time, according to Zhang Nensheng, a retired elementary school headmaster who lived in Shang Xin Wu, or the “new house,” since birth. As the name suggests, it is the youngest of all the compounds, built more than 300 years ago. He has since relocated to an apartment building in a nearby town. He says he was happy to move to the new apartment at first because the facilities in the centuries-old compound were inconvenient. But he also admits that he misses the old days when he could grow vegetables and keep chickens in the yard. 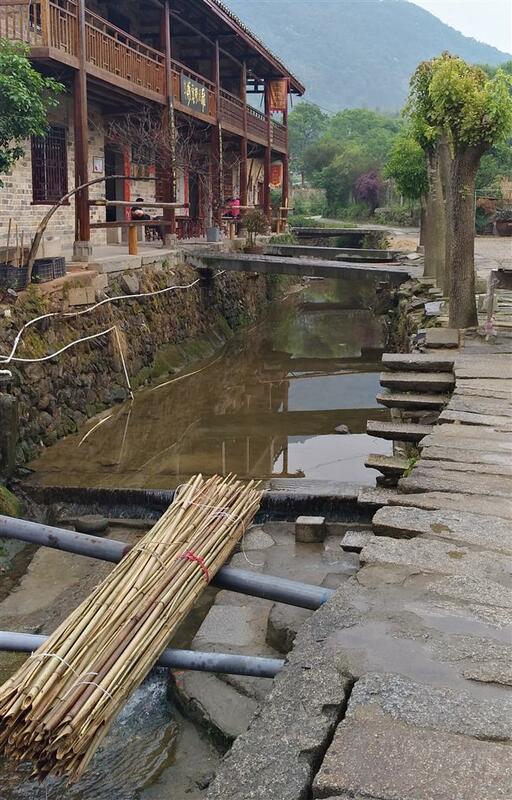 How the drainage system in Zhangguying Village works remains a mystery. The village is named after its forefather and first resident Zhang Guying, a feng shui master who came from an eastern coastal area to settle here about 600 years ago. He and his two friends, Liu Wanfu and Li Qianjin, were attracted by the splendor in the mountainous area. Reading the landscape and following feng shui rules, Zhang picked three spots for settlement: one great for a career, one for wealth, and another that would guarantee many descendents to keep a bloodline running forever. Liu picked the wealth spot and later became a millionaire. His friend Li chose the career spot and became a royal court official. Zhang was left with the place promising enduring generations, and his many descendents in the village were protected from family, natural disasters, war and turbulence for six centuries. Feng shui has a lot to do with the natural environment of a spot, especially the position of mountains and water, and the relationship between the natural surrounding and manmade structures. When Zhang’s descendents began building the large compounds, they adhered to the feng shui rules of their forebear. All the houses were built along a winding creek that runs through the village. The position of the front gates was carefully designed to look out on the best possible mountain view, which was believed to bring good luck. That system is still a mystery today. For hundreds of years, nobody could figure out where the dirty water from all the households went. One Japanese scientist even used colored water to try to track the outflow but found no traces of the dye anywhere. The creek never gets dirty, flooded or dry. Such an excellent water source has made tofu a specialty of the village. Almost every family makes its own bean curd, and some of it is sold to restaurants and hotels in nearby cities. The creek defines the corridor in the center of the village. About 400 years ago, a 110-meter-long narrow path was lined with shops. The village became an overnight stop for merchants. Small eateries, shops and home-stay accommodation in the village are largely run by local villagers. 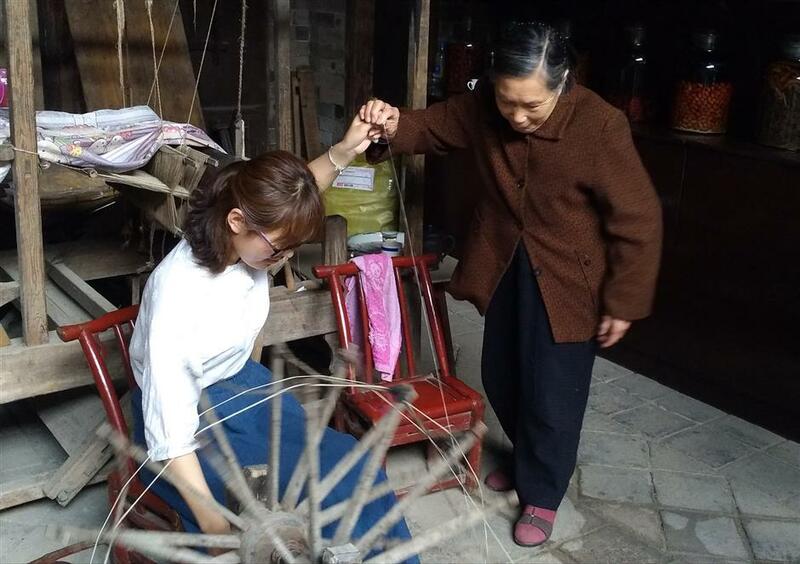 A local granny in Zhangguying Village teaches a visitor how to use traditional loom. How to get there: It takes about five and a half hours by high-speed train or two hours by air from Shanghai to Changsha, capital city of Hunan Province. Bus heading to Zhangguying Town departs once a day from the Changsha East Bus Station. From Yueyang City, there are regular buses every day to Zhangguying Village. The trip takes about an hour.